This guest post is by Michael Boylan, founder and CEO of the Reach For Me Network, a support and advocacy community for caregivers of children with special needs. A bestselling author of business books, Michael's latest work is Reach For Me, a memoir about surviving the loss of his marriage, home and business after becoming a father to a child with special needs. Michael's 18-year-old son, Connor, has Williams Syndrome (that's them above, with Connor fresh off a performance of Chitty Chitty Bang Bang at age 14). The pair live in the Minneapolis area. 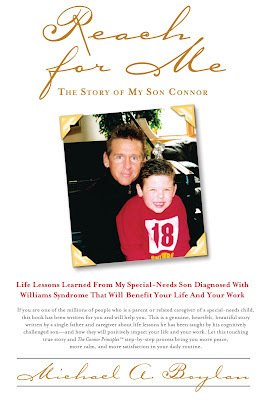 As Connor grew up, Michael realized his son was showing him the way. The book features The Connor Principles, a system of rules to live by. The below essay centers around number 8, "Carve your future." On rethinking your dreams for you and your child. Receiving news that your child has been diagnosed with a cognitive and/or a physical special need brings with it a host of intense emotions including deep anger; confusion about the direction of your life and your family's; general anxiety; doubt; frustration; and sometimes, depression. The news for caregivers and families of special-needs children (about 35 million of us in the U.S. alone) is often very intense to digest and process, regardless of one’s personality. 1) Go off by yourself for a couple of hours and make a list on paper (or on your favorite electronic device) of your dreams, your goals and the really important things that you hoped to accomplish or get done in the next five years. If you are married or in a significant relationship, have your partner do the exact same thing by themselves. 2) Review the list by yourself first, tweaking it as needed before sharing it. 3) Go through your list again and note what you are worried about not accomplishing, achieving or realizing. Be brutally honest; this is no time to mask your emotions or frustrations. 4) Share your list with your spouse or significant other and have them do the same with you, so that you both have an understanding of where each of you is coming from. If you are not married or in a serious relationship, share your list with the important people in your life that may help you out in the care of your special-needs children. Doing this can help you recalibrate (if you feel the need to) dreams, goals and objectives. It's not easy to do, but it's important for bringing new peace, calm and insights, as well as tapping into new energies that will help you to move forward with a renewed sense of purpose. Commit to building new traditions around your child. It's normal to feel as though family traditions are more difficult to keep in place. So, create new ones! For example, Connor and I have turned our weekly grocery shopping at Target into an exciting Saturday afternoon ritual. He high-fives all the cashiers as we check out, shares what he has done for the week, then tells them about his upcoming band performance and asks them all to attend. Whoever thought that going to Target could be so much fun? Connor even talks about it at school. Connor and I have also built a tradition around going to the car wash every day since it brings him such joy. He speaks in his limited Spanish to the people who work there. And, bonus, we always have an amazingly clean Jeep! These experiences bring me joy, too—because when Connor is happy, I am happy, and because they force me to chill out. Once a week, guys come to mow and weed-whack the lawn, followed by blowing the leaves. Connor loves nothing better than sitting on the front stoop of our house and watching the guys do their thing. I used to fight this, telling myself I had no time. However, this has forced me to relax, and it's amazing how much simple satisfaction I gain by watching Connor enjoy. Make a list of three to five new traditions you could do together as a family that could bring newfound laughter or happiness and teach your other children new perspectives. Start doing them, be it once a month or week. They'll protect your sanity and emotional health, too, given how caregiving can press all of your buttons, sometimes all of the time! These rituals help keep us more even and more calm, and maybe even more grateful. Guard and protect your relationship. 1) Witness your significant other doing something special for your special needs child or your family, and then, when they least expect it, compliment them on why it was so special to you. Then reward them, whether it be taking them to dinner or going for a coffee or giving them a card. 2) Think back to some of the crazier things you used to do as a couple, or before you had a child with special needs. Find a time to bring them up and reminisce; if nothing else, you will both get a good laugh out of your trip down memory lane. But it could inspire you to plan a new adventure, too. 3) Everyone says that communication is paramount to the health and durability of the relationship. And yet, it is so hard to actually practice in real life, especially as stresses pile up. One way to keep the communication open is to carve out 15 minutes in the morning or right before bed for a check-in. Share two things from your day that happened, and two things you are grateful for about that person or why you feel lucky to be with them. Who knows what might happen next! There is no one who doesn’t love to be complimented and acknowledged. Visit another special needs parent. When you're feeling overwhelmed by responsibilities, it may sound counterintuitive but lending a hand to another parent who seemingly has it worse can put things in perspective for you and help both of you feel good. Also great: Encourage your child with special needs to help out. It can be really rewarding for everyone. At the very least, take another special needs parent out for coffee and just listen to them talk, period. You are helping them release whatever is on their mind, and you will also feel the power of being there for a fellow caregiver. Take care of your body, mind and spirit. As a type-A personality, admitting to others that I was struggling from time to time with my caregiver responsibilities seemed weak. My style was to power through and see if I could do everything that I used to do before Connor was born. However, the harder I pressed forward with my can-do attitude and mentality, the more frustrated, angry and depressed I became. I've learned to make more time for me. How? natural environment. It clears my mind. 2) I plug into my son's serenity. Connor likes to bounce on a big red ball; it calms him down. feeling sorry for myself about the things I don't have. Be silent with your child once a week. There is so much we can learn from our children, even when nothing is said. There is sometimes a magical vibe that I get from Connor just by sitting quietly by him or rubbing his back or his head (if he will let me). Try it sometime with your child and see what comes. Ender-Chan, can you educate us on what ChlorSan means? Of course we can Google it but would be nice to hear from you. Sanguine-Fun, outgoing, and sociable type. People of this type are the life of the party. Such a great post. I've been doing a really terrible job of taking care of my body, mind, and spirit. So we went to the beach, last minute. It helped. Thanks for this. xo Ellen. Yes, a great post. So glad you got to go on a therapeutic beach getaway, Kristi. I could use one, but I'm settling for a massage tomorrow—my back is in knots! Please don't call yourself a special needs parent unless you yourself have special needs. It makes it harder for people like me, an autistic person who wants to have children, to find resources about actual special needs parents when there are parents calling themselves that when they're not. And would you call yourself a special needs sibling if you were a nondisabled sibling of a disabled person? It's not your disability, that identity doesn't belong to you.